I thought I had a picture of Golden Nugget, but it turned out to be White Castle. X was meeting his friend J for breakfast at Golden Nugget. Nine-fifteen was the plan. J is always late, so X decided to get there at nine-twenty five. “For once I’m going to walk in and he’ll be sitting there,” thought X. But when he got there, no J. X sat down and had some coffee. The two have known each other a long time, from back when they used to be slackers. “We’re still slackers,” said X, “but we used to really be slackers.” So even when it got to be 9:40, 9:50, X didn’t call or text J. “In the old days, forty-five minutes was nothing,” X explains. Therefore, he just sat. Finally, a little after ten, J called X. “Where are you, man?” They were both on time, but at different Golden Nuggets. I just had a weird, my brain works in mysterious ways, moment. 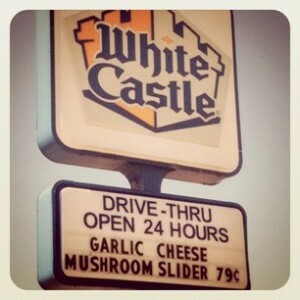 Your picture of White Castle coupled with the title of this post made me think of that show from the 90’s called Sliders. Funny how my mind can simultaneously conjure a picture of a small hamburger and a TV show in the same moment. Anyway, it stared Jerry O’Connell, and he was a high school kid that figured out a way to “slide” through a hole in the space-time continuum and go to other dimensions that co-exist with our own. Most of the places he went were very much like our own world, just with something off. So the same Golden Nugget could exist in multiple dimensions. For a moment, I thought you were going to say they were both at the same Golden Nugget, but in different dimensions. That would be crazy. Whoa. I’m gonna take a stand and say that IS what I was saying. Cause why did I have a picture of White castle in the first place? And SLIDERS? come on… now I have to see that show. The existence of White Castle is probably evidence of a ripple in the space-time continuum. Oh, and you can Netflix Sliders. c. Your strange affection for all things tangentially White Castle.